We have with us well established CNC machine shop facility that is equipped with precision machining, milling and turning equipment which ably supports all involved in-process demands. With presence of CNC (computer numerical control) facilities, we are able to bring better optimization in productivity as well as match up with the exact specifications deatiled by the clients. Mostly the CNC machines have three axis (X axis, Y axis, Z axis), that helps in providing greater accuracy with better control over involved procedures, our CNC machine shop also has facilities for Vertical machining and Acne turning. This helps us to achieve considerable reduction in terms of costs involved and production time. Further, these CNC machines are well handled by experienced support staff that allows us to deliver castings in fully machined conditions. CNC Machining facilities form the inner base of operations and suit the working environments where customers require shortest lead times and a single source to cast, machine and finish components. Our well developed machining facilities indeed enhance the competitiveness of our customers by optimizing quality and productivity of involved processes. 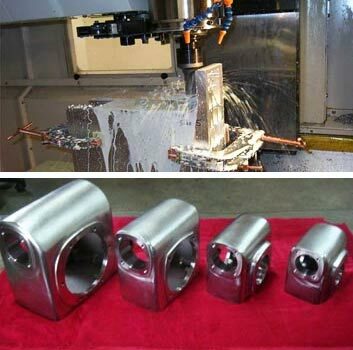 Our team of experienced specialists efficiently handle the CNC Machining and casting processes and knows all the important aspects that are required to be kept in mind while working on casting components. They take due advantage of available machine tools including fastest and most versatile machines and ensure latest technology is employed to minimize production costs as well as enhance product quality. Presently, we have well established CNC Machining Centres and CNC Turning facilities that add on to our capacity to accept largest castings. Here, we assure our customers of all machines having synchronized tapping so as to achieve maximum speed and threading accuracy.